Cuttlebone—that funny, white oblong object shaped like a canoe—is found in bird cages everywhere and can be purchased in the bird aisle of virtually every pet store. But what is it, exactly? Is a cuttlebone something pet birds actually need? Cuttlebones are not actually bones, but rather the internal shell from the cuttlefish, a member of the cephalopod family of sea creatures. The cuttlefish is actually a mollusk, related to the octopus, squid, and nautilus, and a cuttlebone is an internal shell with gas-filled chambers that keep the cuttlefish buoyant and able to maneuver in the water. Ground up into a fine powder, pulverized cuttlebone was used as a polishing agent by jewelers. Jewelers also used whole cuttlebone as a shaping material for making molds for casting metal jewelry and other small decorative metal objects. Jewelers cut the bones in half, rubbed the halves together until they were perfectly flush, then carved mold shapes into the bone. Because it could withstand high temperatures, cuttlebone was the perfect material to use for making casts for poured metal. As a fine powder, cuttlebone made an excellent polishing agent in toothpaste. High in calcium, pulverized cuttlebone can be used as a dietary supplement that also serves as an antacid. Cuttlebone serves several functions for pet birds, as well as for other pets. 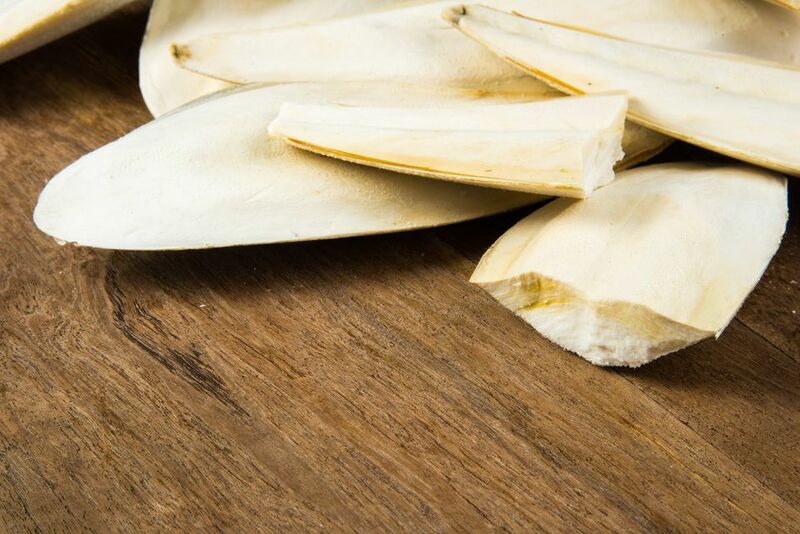 Cuttlebone is offered to reptiles, hermit crabs, chinchillas, and turtles, where they offer a good source of additional dietary calcium. A cuttlebone is great for these animals because it floats and doesn't foul the water as other supplements can. And the extra calcium helps to increase the density of eggs for those animals that lay them. Cuttlebone has about the same amount of calcium as eggshell by volume. But it is considerably more convenient to offer cuttlebone rather than feeding eggshells, which need to be boiled and disinfected before offering them to pets. For birds, the value of cuttlebone has several aspects. If your bird ingests some of it, they benefit from the calcium found in cuttlebone. In addition, the act of playing and nipping at a cuttlebone serves to polish a bird's beak and helps remove outer scaly layers. Finally, cuttlebones offer an object of play and exercise for birds. Not all birds use cuttlebone, but for those that like them, cuttlebones can be a healthy interactive item for the cage or play gym. A cuttlebone enriches the cage with another object and another texture. Birds are healthiest and happiest when they are presented with choices, and even the little choices are important. There are many different ways you can offer cuttlebone to your bird. Cuttlebone normally comes with a set of clips that allows you to attach it to the side of the cage. Or, you can secure the cuttlebone to the bars of the cage using a plastic tie. Some people find that their bird is more likely to play with the cuttlebone if they simply shove it into the cage sideways through the bars. Or, you can just place it on the bottom of the cage, where the activity of pushing it around and tossing it offers great exercise as your bird polishes its beak and ingests additional calcium. If your bird is not into actively playing with a cuttlebone, another option is to just break off bits and offer it sprinkled on top of its food. Some families use a mortar and pestle to grind up the cuttlebone. Whatever method works is acceptable if it offers the calcium your bird needs.